This summer I ventured beyond Deer Isle — not that far, but still I ventured. And then I finished up the year with a snowscape of Stonington that I’ve been wanting to do since, oh, last winter. 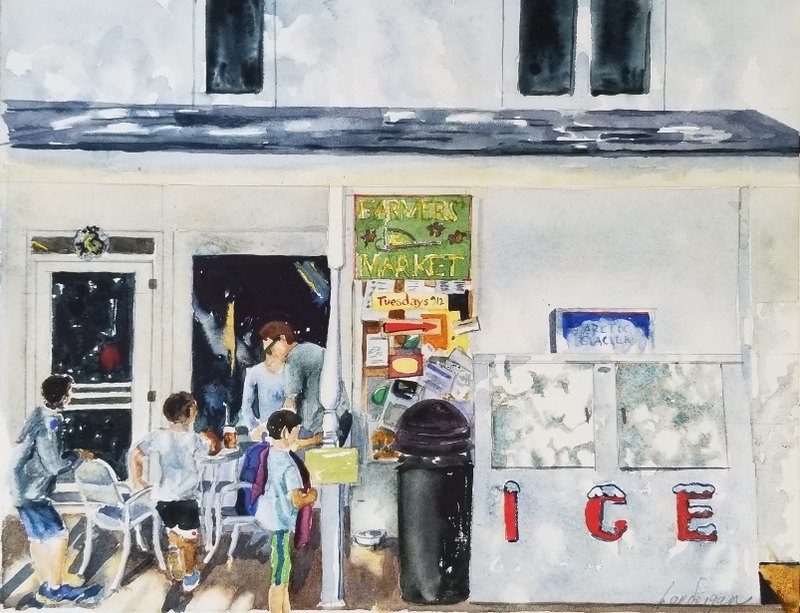 You can’t quite see the Stonington Public Library in the painting — it’s behind the building to the right. But now about a dozen of my paintings are hanging on the library walls. I’d like to put up a few more, but I’ve got to find frames for them first. The Stonington Library recently underwent a major renovation, and now it’s even more of a jewel. There’s a new reading nook, a handicapped-accessible public bathroom (a very big deal in an island tourist community) and a new energy efficient furnace. Sadly, the fabulous Vicki Zelnick, who has done wonders with the library, will retire soon. I’ll miss her. 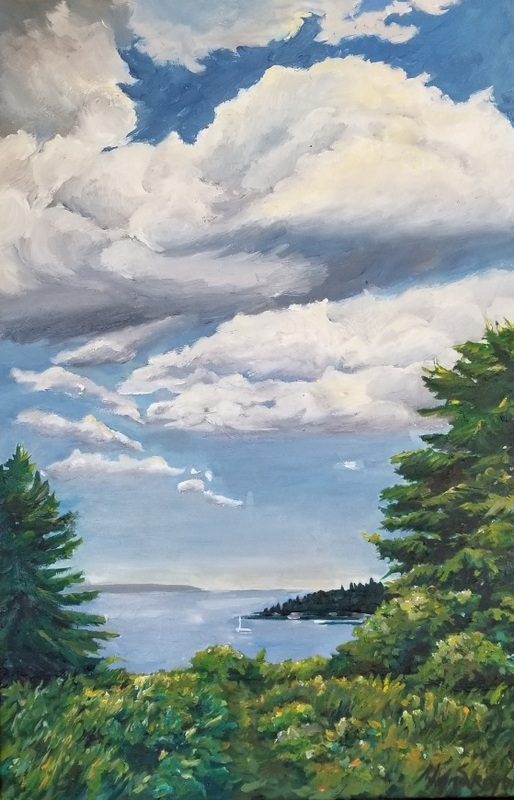 I’ve already posted my first painting of Brooklin here, called Naskeag Point. And my second, come to think of it — Wooden Boat — here. 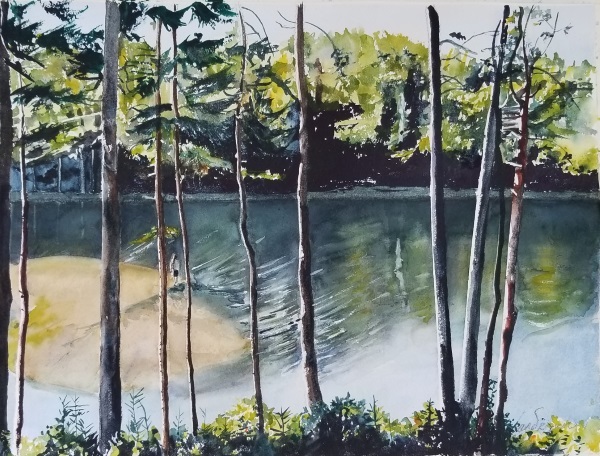 Recently I finished another one, a watercolor called Wooden Boat School Buoys for fairly obvious reasons. Wooden Boat School Buoys, watercolor. 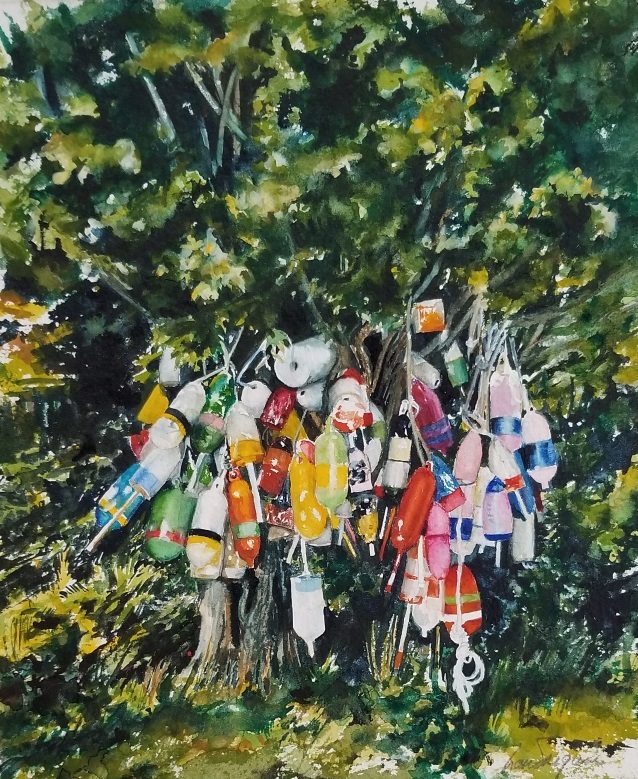 I know the whole buoys-hanging-from-a-tree thing is a cliche, but these had so much energy I had to paint them. Besides, as an art history teacher once said, There’s a good reason cliches become cliches. 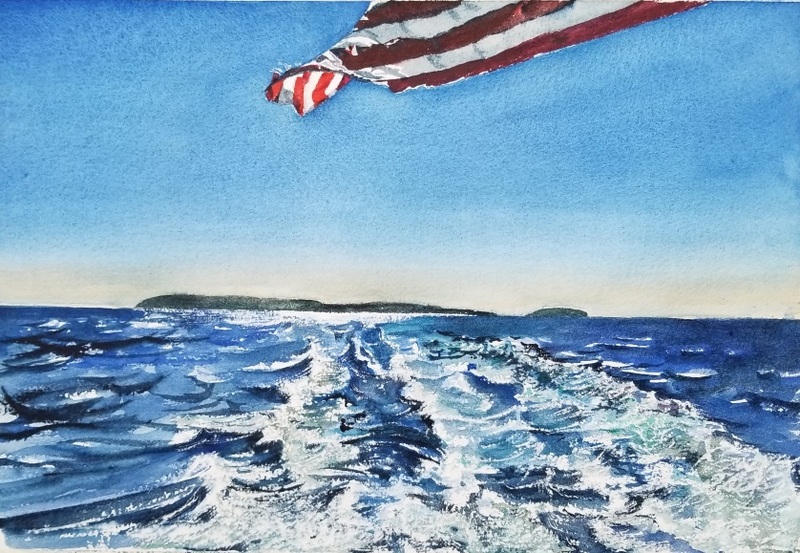 Here’s a watercolor of Monhegan Island from the stern of the Laura B (or was it the Elizabeth Ann?) 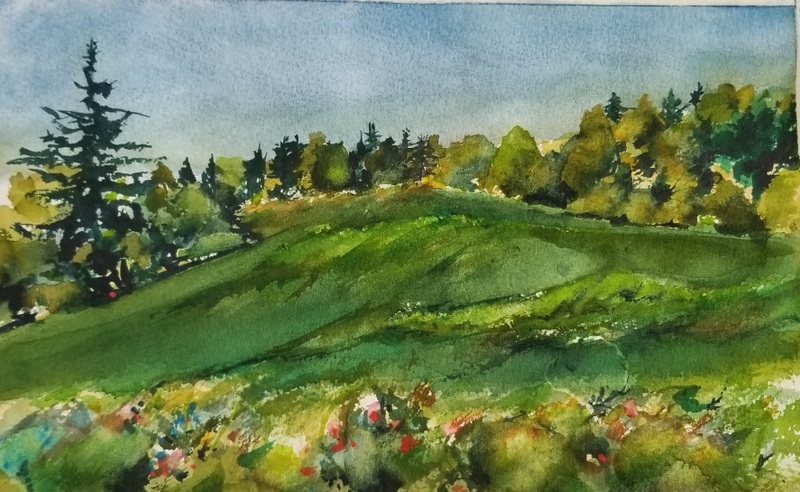 Anyhoo, I’d been immersing myself in Andrew Wyeth’s paintings, both at the Farnsworth Museum and at the Wyeth gallery on the second floor of the Port Clyde General Store. One Wyeth painting, an overhead view of a rushing stream called The Carry, really wowed me. 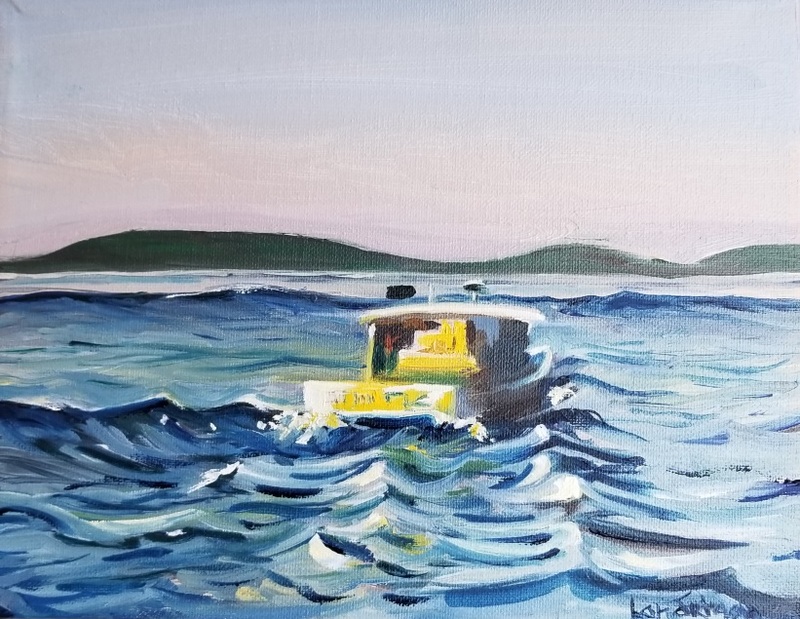 Later, as I sat looking out at the wake of the boat I got inspired to paint this. 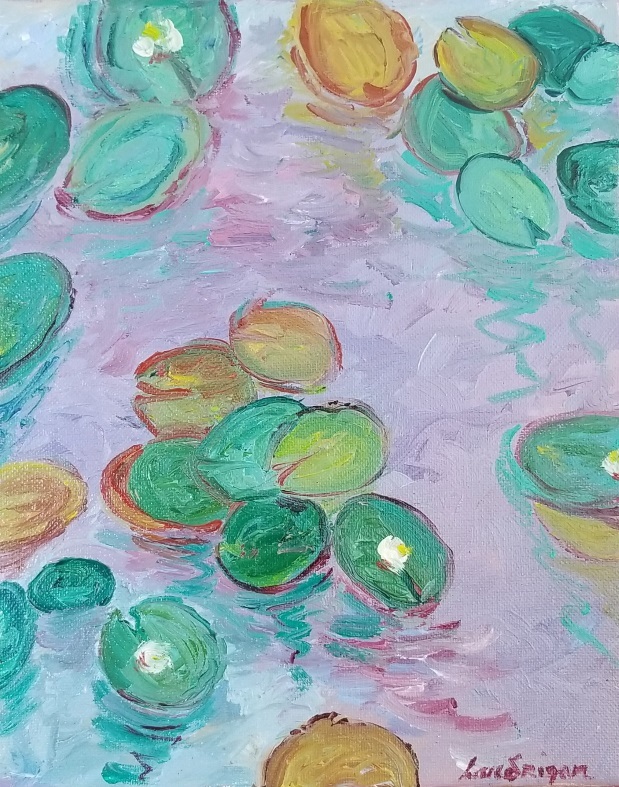 Then I did a couple of small oils, again inspired by a day trip to Monhegan on a sunny fall day. 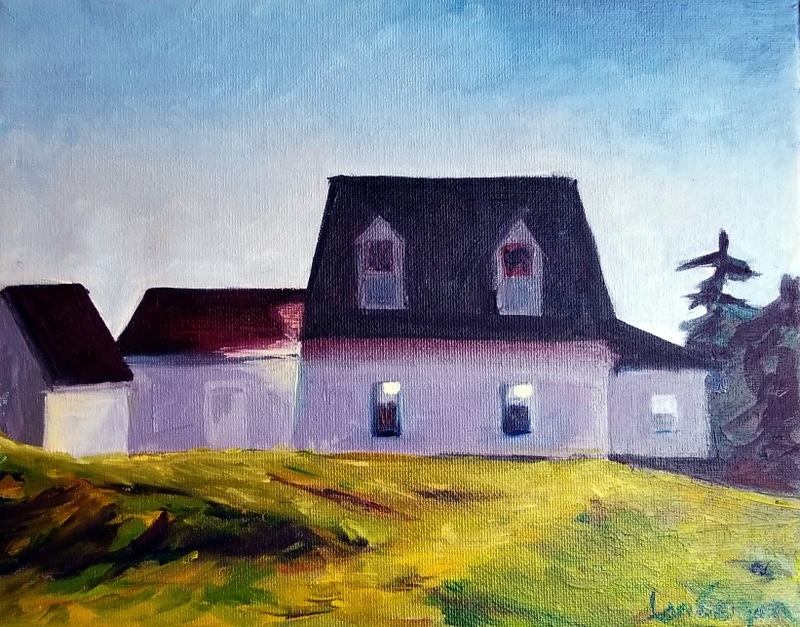 Monhegan Museum, oil on canvas. 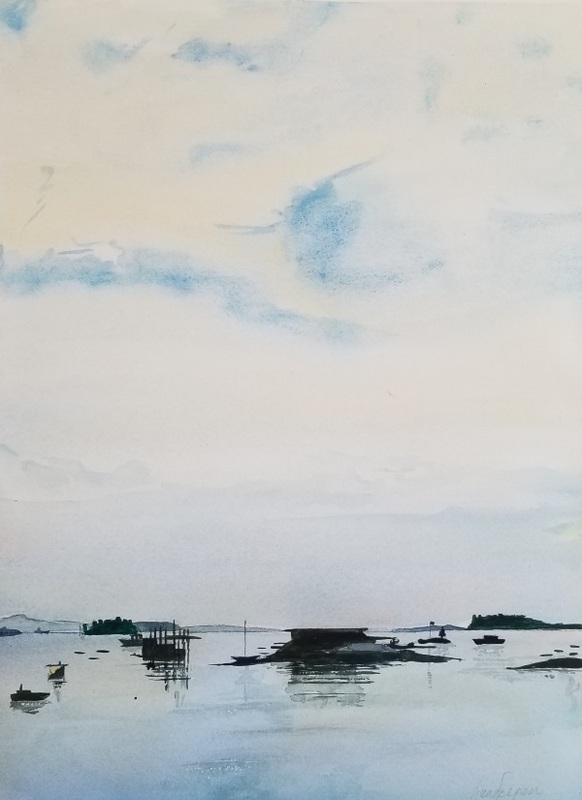 Some brand-new cards along with old favorites of mine are on sale for a one-day only pop-up market at the Deer Isle Artists Association from 10 am to 5 pm on Saturday, December 1 at the DIAA Gallery. 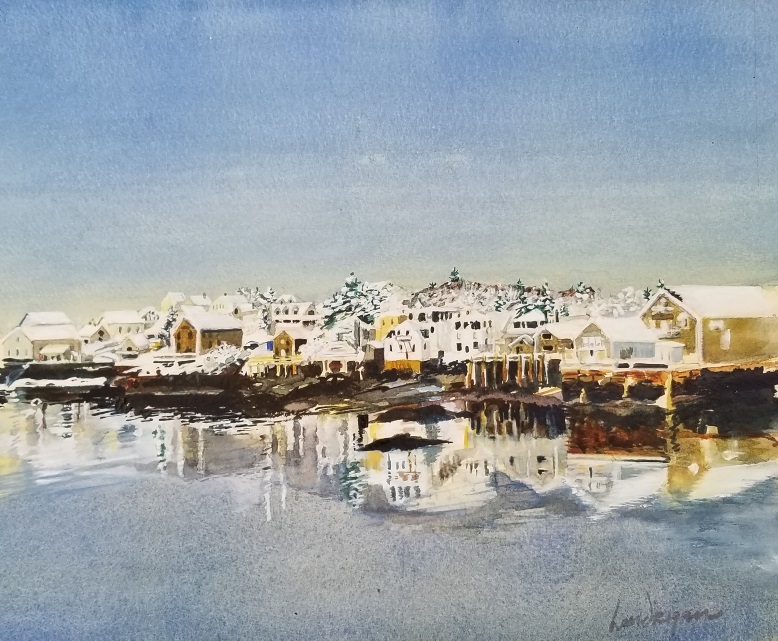 I’ve been wanting to paint a snow scene of Stonington for a long time, so this fall I buckled down and painted this watercolor of the town from the harbor. 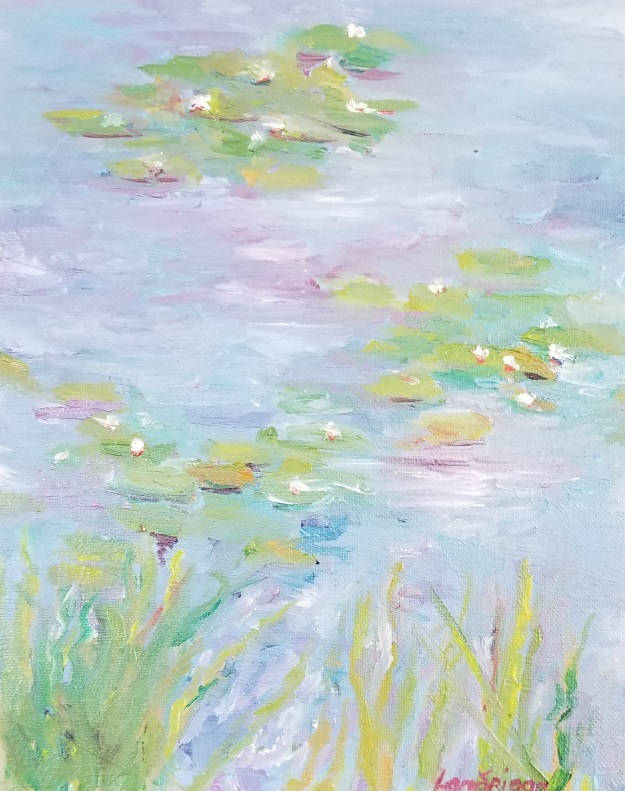 I made cards of the painting, which are on sale at the pop-up market. Cindy Bourque-Simonds, DIAA’s most tireless board member, runs the pop-up market by herself. 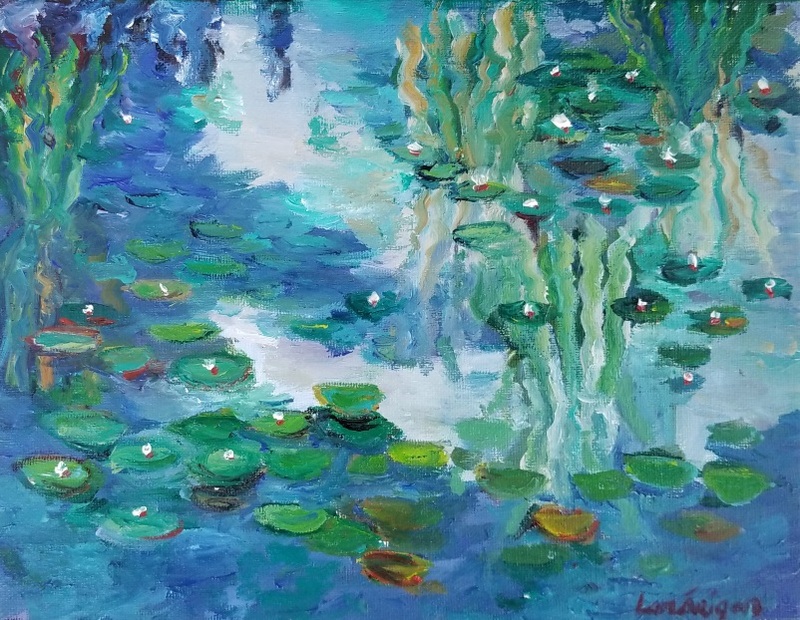 “This is a different kind of a show for us, because many of our artists are trying something new and pricing them as affordable gifts,” she said for the official press release. 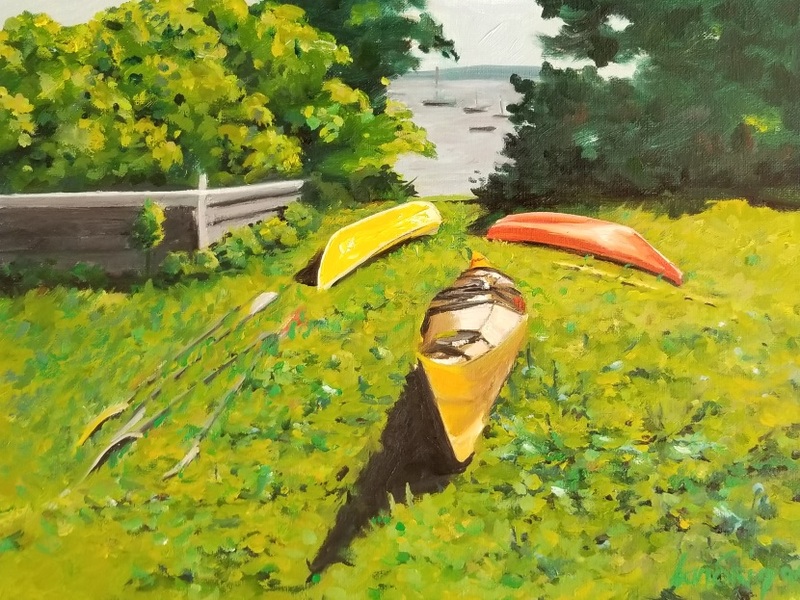 For me, something new is an oil painting of the kayak launch at the Wooden Boat School in Brooklin, Maine. 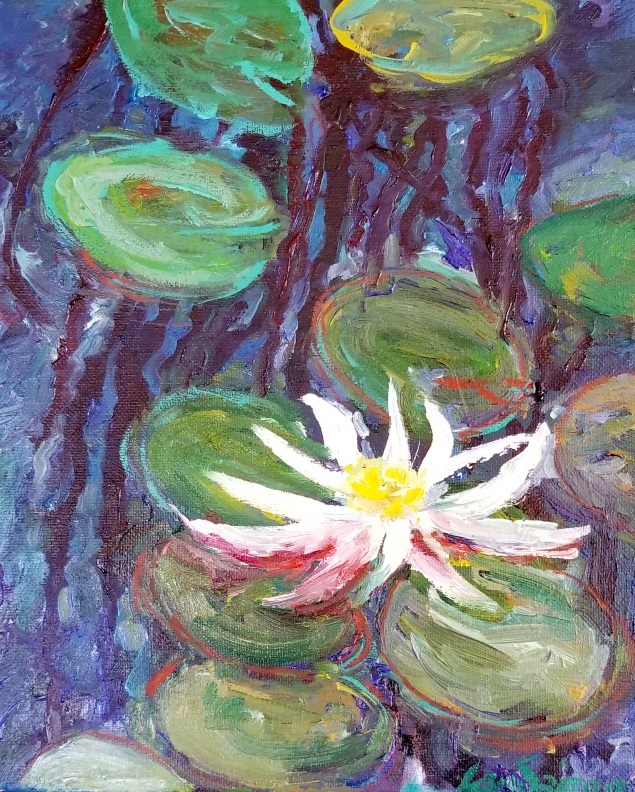 That, too, is on sale at the pop-up market, along with a small oil painting of my friend Leslie Anderson. 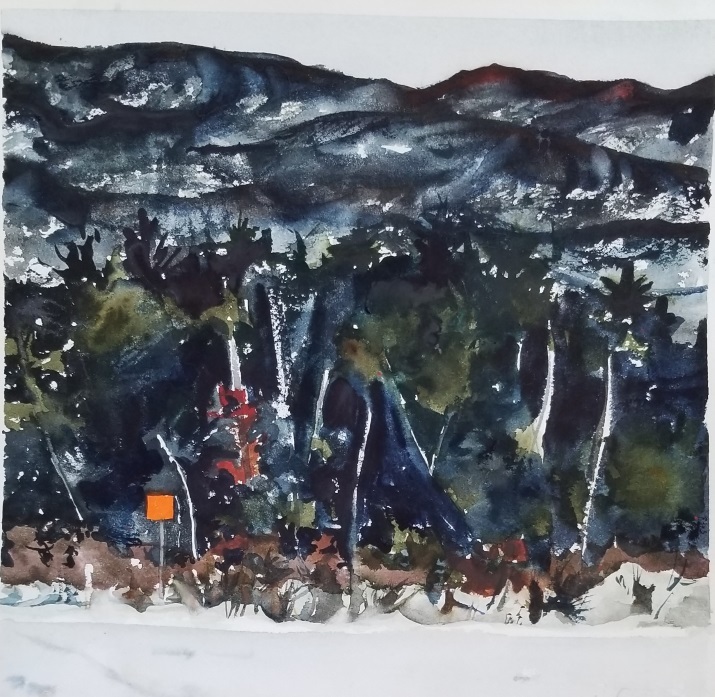 We painted together last fall on the top of Kezar Mountain in Little Deer Isle. As you can see I painted it loosely, which was quite fun. Next on my agenda: I have some big — for me at least — wooden panels. They’re two feet by three feet, and I plan to finish them over the winter.